Kelly Kuehn is a part-time elementary teacher at Alpha Omega Academy, working with 5th and 6th grade students. She especially enjoys getting to personally interact with students and help them through questions when they need assistance. Prior to working at AOA, Kuehn taught 4th and 5th grade students in New Mexico for five years, and she has been working with students in a variety of capacities for over 15 years. The fourth child in a family of five, Kuehn was raised in Mishawaka, Indiana. She said she has always been musical, and she grew up playing many instruments, including the cello, clarinet, piano, and guitar. 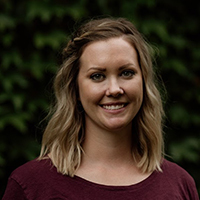 Self-described as funny, laid-back, and friendly, Kuehn loves to cook, watch Mary Poppins, and spend time with her husband and their young son. Kuehn also said people might be surprised to learn that she knows how to juggle. She has also studied Japanese for 5 years and hopes someday to visit the Land of the Rising Sun in person.